The powerful VoteLynx meeting management and roll call system simplifies time intensive public meeting agenda creation and record keeping tasks. Its high performance architecture features flexible meeting configurations, extensive agenda integration, request to speak, live video stream management and powerful audiovisual control system. An intuitive workflow contains shortcuts and automation tools to help staff prepare for, and manage busy meetings. 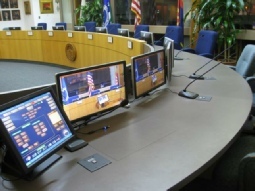 Motions, votes and actions are recorded into electronic documents, displayed on video displays and broadcast to cable and streaming video systems. The built-in VoteLynx audiovisual control system marries the meeting workflow with the meeting room’s audio, video and presentation equipment. Only minimal training is necessary to seamlessly capture all meeting actions and post meeting data and reports. VoteLynx easily expands as needs change and grow, without fear of obsolescence. "The beauty of the VoteLynx system is that it understands intuitively how a city council operates. VoteLynx is remarkably simple to use and gives us everything we could ask for." High performance server-based meeting management system manages agenda documents, meeting flow, motions, votes and video display plus plus request to speak, audio and speaker timer. Includes LCD MiniTouch or Graphic User series voting stations. Features fully configurable audio visual control of audio mixers, cameras, switchers, lighting and other equipment in the meeting room. PC-based system with LCD MiniTouch or Graphic User series voting stations features powerful yet easy to use VoteLynx software to manage the agenda, meeting flow, voting control, tabulation and video display control as well as timer control.